Making your own stamps can be as simple as carving a shape into a potato. 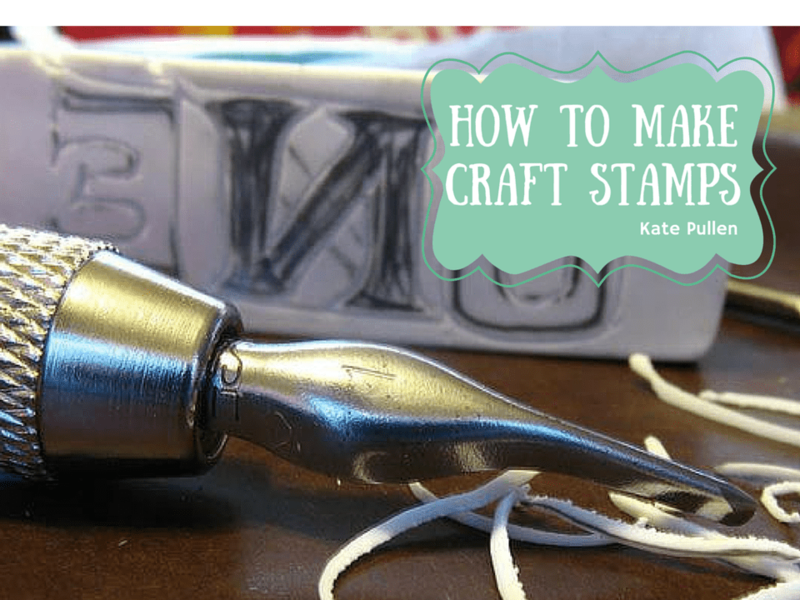 However, there are many more sophisticated ways of making your own stamps. Some techniques require very little in the way of special equipment. The key to success, whatever type of stamp you are planning to make, is a good design. Potato printing is one of the most simple forms of creating a custom stamp. While this is often thought of as being an activity for children, some surprisingly sophisticated results can be achieved. Other types of vegetable can also be carved. Carrots, for instance, are great for making little 'peg' stamps. When you are making stamps from vegetables or fruit, they need to be used immediately as the stamp will dry out, making it difficult to get a crisp image. See this ​how to make potato stamps tutorial. Craft foam is easy to cut and when applied to a block, can make a great stamp. Craft foam can be cut and attached to a normal acrylic stamping block or other solid form using a glue stick or other adhesive. Many simple shapes are ideal for cutting out of craft foam. Some craft suppliers sell ready cut craft shapes which can also be a quick way to make custom foam stamps. Erasers are low cost and easy to carve. They offer a good introduction to stamp carving. Plastic erasers are suitable, as are art gum erasers. The main restriction is the size. Erasers are typically relatively small and as such are best suited to smaller designs. Soft block or carving block is a material that has been specifically designed for stamp carving. This is easy to carve and available in different grades. A soft block is easy to carve with cutting tools, and images can be transferred onto a soft block for carving using simple tracing techniques. It is now possible to make clear photopolymer stamps at home using very little special equipment. Sachets or pockets of photopolymer are turned into clear stamps by the use of light and a black and white image. Larger systems are making the creation of stamps to sell a real possibility. Many rubber stamp companies that make rubber stamps for business and office uses also make custom rubber stamps. They will typically produce a stamp using your artwork or will offer a design service. It is important to check what type of stamp that they will be producing. Many rubber stamp companies that produce stamps for commercial use produce self-inking stamps, which may not be suitable for your arts and crafts projects. Independent stamp designers and companies also often offer a bespoke design service. There are many options available, but it is best to discuss your requirements with the stamp manufacturer, perhaps even explaining how you plan to use the stamps, before proceeding.